As I make my way back through older recipes, I’ve realized how much my cooking style (for the site) has changed over the years. While the the recipes from yesteryear are good, I’ve found myself branching out into new flavors, ideas, and recipes. It’s a good thing but don’t be fooled, there are still recipes from the archives that I use quite a bit. One of my favorite recipes is from four years ago and it’s super simple: smother a potato with chickpeas tossed with buffalo sauce. 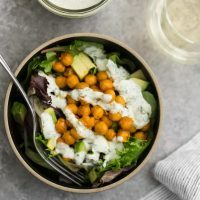 I still have a weakness for buffalo sauce and this buffalo chickpea salad is an updated version of that older recipe. Many recipes call for cooking the chickpeas in the sauce but I much prefer to fry the chickpeas, then toss them in the sauce. This way, the tangy buffalo sauce mixes with the cool ranch. 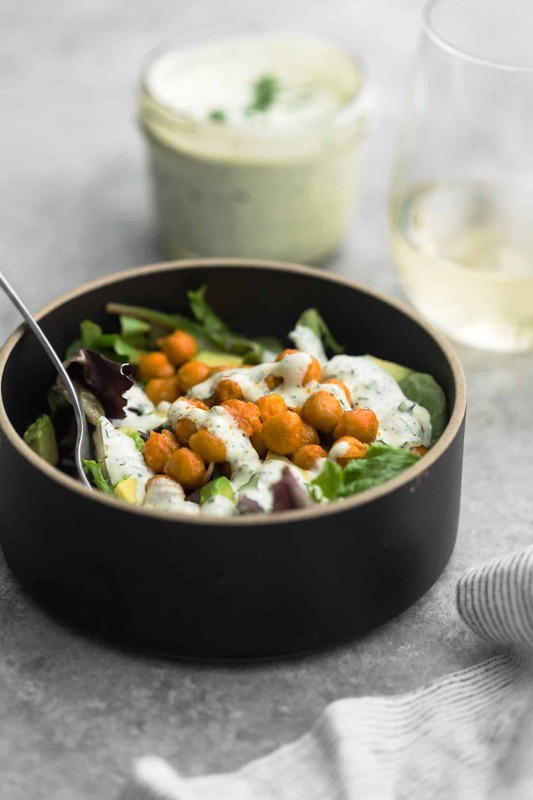 Cooked chickpeas tossed with an easy buffalo sauce and served with homemade ranch- a perfect lunch or light dinner. In a blender, add garlic and pulse until minced. Add in remaining ingredients for the dressing and pulse until just combined (any longer and the dressing might turn green). Place in refrigerator and allow to site (the dressing is best done ahead of time, up to the day before). Dressing will thicken up as it sits. Add a splash more buttermilk if needed. Heat a skillet over medium heat. Add the olive oil followed by the chickpeas. Cook chickpeas, shaking pan occasionally, until most have popped and turned golden, 4 to 6 minutes. In a small sauce pan, heat the red hot with the butter, garlic powder, smoked paprika, and salt until butter has melted. Whisk until smooth and combined. More or less butter can be added depending on desired level of heat. Stir in fried chickpeas and toss to coat. Let sit while assembling salad. Divide the salad ingredients into two bowls. 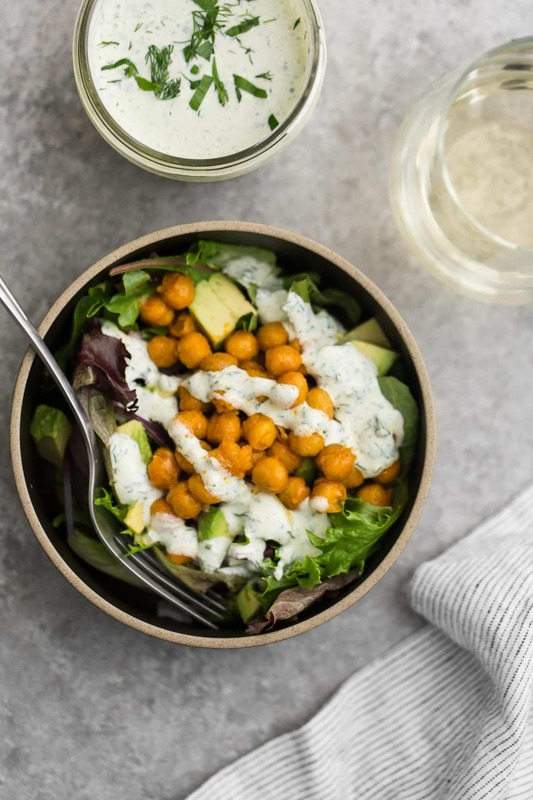 Top with chickpeas and a drizzle of ranch. Tips & Tricks: make the dressing ahead of time. The homemade ranch will keep for about a week and the flavors will develop more as it sits. 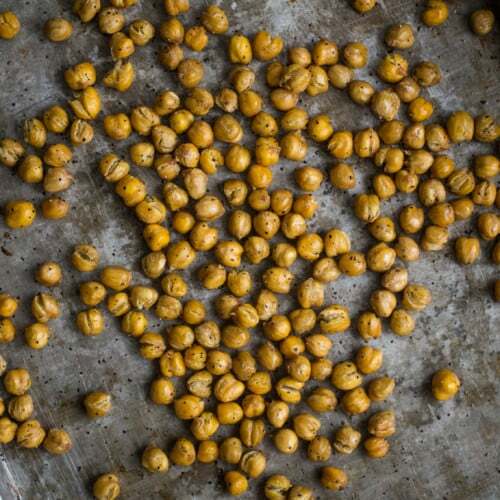 The buffalo chickpeas are easy and make for a great topping/filling. Besides the suggestions below, I will add the buffalo chickpeas to tacos, quesadillas, or as mentioned above, a stuffed potato. Play around with the hot sauce/butter combination to find the right balance for you. I like my sauce with barely any butter but others like it 50/50. BBQ Sauce: In place of the buffalo sauce, use bbq sauce. A fun alternative that works just as well with the ranch! I like this homemade bbq recipe. Stuffed Pita: Place all the ingredients from the salad in a pita- a portable lunch! Vegan: Ditch the butter (or use a vegan butter alternative to cool the sauce down) and use this herby hemp dressing in place of the ranch. This recipe looks amazing!!! I am totally sharing your recipe on our blog later today for our readers. They will LOVE this. My goal with my cooking is to be more adventurous with sauces, I think it’s the best way to explore new flavors and combinations. This looks delicious! Thanks for repeating this recipe! I was conducting a personal food experiment ~4 summers ago and saw one of your buffalo chickpea recipes. That summer I decided I was only eating meat if I (or someone) could tell me the farm from which it came. 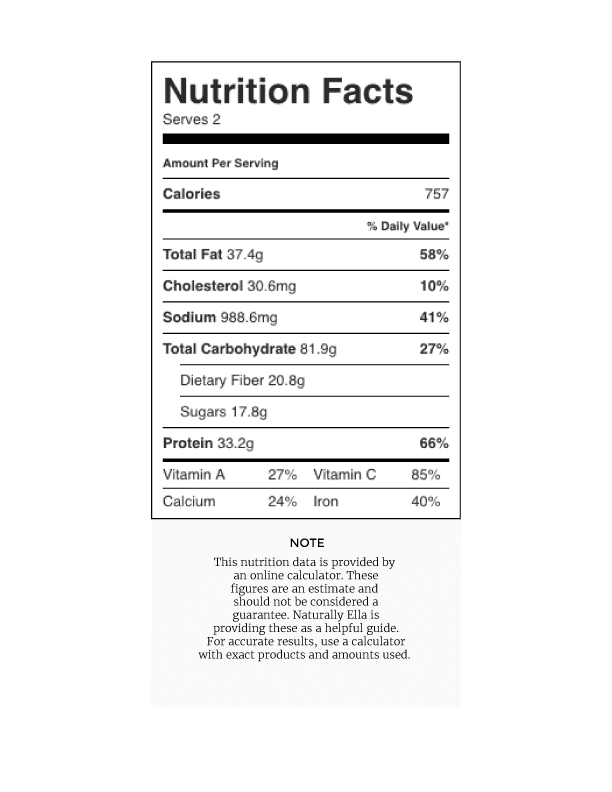 The buffalo chickpeas made me realize that a lot of the foods I liked were not necessarily the meat, but the way it was flavored (helloooooo Franks!) and it forced a mindset shift. I remembered the buffalo chickpeas tonight as my CSA greens are overflowing the fridge and chopped in some scapes and scallions into the sauce and tossed it onto the pinto beans I had on hand. Great salad.